Show me the money, nerd! Finance attracts lots of smart people. But that doesn’t mean you’ll make money from their ideas. Peter Cauwels and Didier Sornette, researchers at ETH Zurich, declared in 2011 that Facebook was worth 15 billion dollars. In a scenario with extremely large growth, which equates to almost 2 billion users, the network’s value would amount to 32.9 billion US dollars. Seven years later, Facebook has more than two billion users. The company has a market cap of 452 billion dollars, more than ten times(!) the value calculated in Cauwels’ and Sornette’s most optimistic scenario. 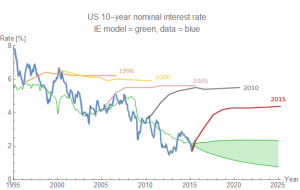 Interest rate according to Smith’s model shown in green. Source. Today (8 October 2018), the interest rate on ten year US bonds is 3.23%, well above the range predicted by Smith. The website of CFM, an investment management firm, talks a lot about data science and its PhD quants. Curiously absent from the site is proof that the company generates superior returns for its investors. The performance stats mentioned on an Australian CFM website are less than stellar. In 2001, Gordon Chang published The Coming Collapse of China. Needless to say, China has not collapsed. Its Communist Party is still in charge. The Chinese economy is more than eight times larger than when Chang made his prediction. Many other analysts, such as professor Michael Pettis, have been bearish on the Chinese economy for a very long time. The website Learning from China keeps a list of their wrong analyses. Next time you hear nerds dishing out investment advice, ask them to show you the money!